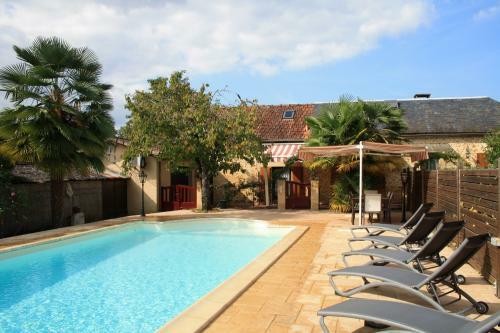 This pretty stone house is situated in a residential area in Sarlat-la Caneda, only 800m from the centre of the medieval market town. 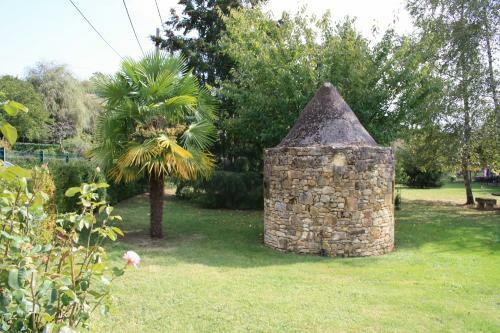 With its 3 bedrooms/2 shower rooms, charming 1200m² enclosed garden and fenced private pool, it is ideal for a large family or for two couples travelling together. * a large lounge with a dining area to seat up to 6 guests and a sofa. French doors lead to the front terrace. * a fully equipped open kitchen with a gas hob, oven, microwave, large fridge/freezer. * a large bedroom with a double bed, a TV, and a wardrobe. * a bedroom with a double bed, a TV, a small chest of drawers, and a clothes rack. * a few steps lead to the attic bedroom with 2 single beds, armchair, desk, clothes rack and closet. * a shower room with a walk in shower and wash basin. For the comfort of our guests the bedrooms are all equipped with air conditioning. Bed linen and towels are provided; beds are made up on arrival. 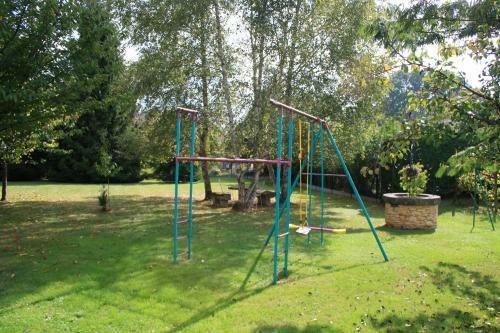 * mature garden of 1200m², fully enclosed, ideal for the children to play in and for the adults to relax in the shady area near the stone borie. 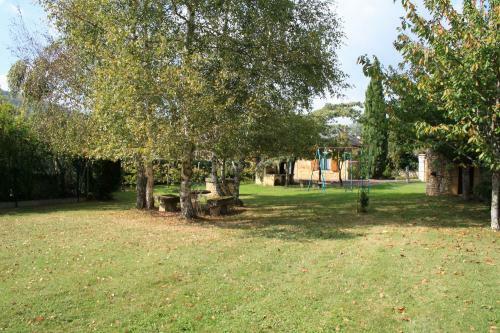 * superb 10 m x 5 m pool with an electric cover. No matter the weather outside, you'll be able to swim under cover! During the hot summer days, the cover can be completed opened. It is equipped with 6 sunbeds and parasols. * Parking area for up to 2 cars, and garage for one car. 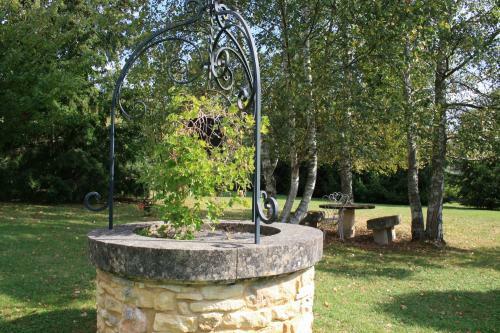 Wonderful villa in a delightful location close to the centre of Sarlat. The pool and amenities are superb! Brilliant holiday, we would definitely choose this property again. The exterior of this property is amazing and definitely warrants 5*. The pool is wonderful and even when the weather is wet or cold, you can go in the pool with the cover on. 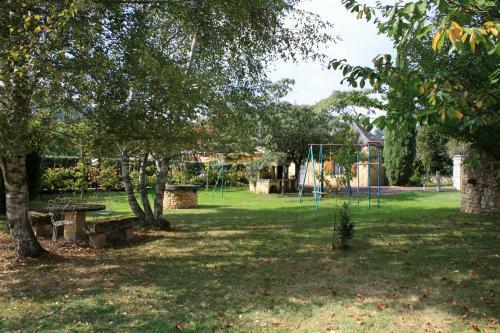 The garden is big with a fantastic built in barbeque. Inside is fine and we were grateful for the air-con when the heat-wave was at its peak. Only downsides: the drains in the bathroom are a bit smelly and the entrance to the property is extremely tight, quite tricky with a long estate car. The hot water went off one day, but the agency were incredibly helpful and came out to fix it straight away, they were very friendly. Sarlat is stunning and easily accessible by foot. You can walk to the big Carrefour, a good Boulangerie and a good Boucherie. We loved cycling along the attractive Voie Vert, even in peak season it was not overcrowded. You can cycle to castles or to very picturesque restaurants/ bars. 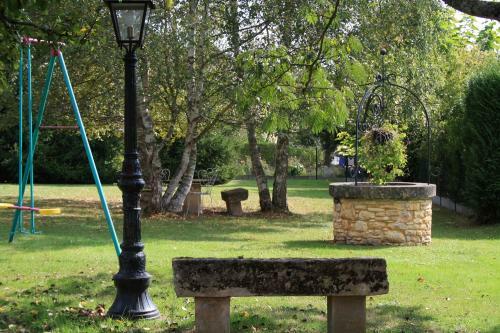 The home Les Palmiers is situated in a residential area of the famous market town of Sarlat, only 800m from the medieval centre of the town, listed by the Unesco! The restaurants, shops, and entertainment are only a short stroll away : leave the car in the garage and enjoy walking through the medieval lanes to discover the beauty of the city! The bed linen and towels are provided with no extra charge.